1 Miss Poland Official preliminary. Exporter of fresh vegetables and fruit from Poland. Producer of masterbaches and additives from Poland. manufacturer of oak and pine furniture. maslow, poland. futon mattress manufacturer based in poland. utah company, with operations focused in poland. poland. designer of blouses, skirt and dresses. exporter of christmas decorations and ornaments. poland. Polish manufacturers and exporters directory. manufacturer of a baggage wrapping systems. specializing in the implementation and management of clinical trials in poland. Grower and exporter of fresh white champignons. Poland. poland. manufacturer of t-shirt, polo, and polar jacket. poland. wedding dresses, bridal gowns. manufacturer of enamel household utensils and cookware. poland. manufacturer of furniture from reclaimed pine from disassembled old homes in poland. poland. ladies and youths clothes production. Translation in English<,>,Polish. Company based in Poland. Poland based provider of short run and digital book printing. poland. specialize in suits, formal blouses, jackets and dresses. produces and wholesale sport cups, trophies, figures and gifts. poland. Poland designer presents collections and bridal highlights gallery. manufacturer of upholstered sofas and chairs, wardrobes, and office furniture. poland. Producer of birch plywoods. Includes specifications and products available. Located in Poland. manufacturer and exporter of custom made tables and chairs. poland. manufacturer of executive furniture, work stations, counters and cabinets. based in poland. Collections and illustrations portfolio of Poland designer includes biography and links. Translation, interpreting, subtitling, localisation in all Eastern European languages. Company based in Poland. Poland. Custom dyeing and texturing of polyester yarns. Color card. English and Polish. produces strollers and beds for dolls, blackboards, wooden blocks and sand boxes in poland. poland. manufacturer of decorative laces, trimmings, ribbons, appliques from satin, lycra, suede. importer and exporter of home and office furniture from manufacturers in poland. Custom-made stained glass windows for residential, commercial and ecclesiastical needs. Located in Poland. Agency based in Poland provides translations from English, German, Spanish and French into Central-European languages. Poland. Manufacturers of collections of bath robes. Also, dressing gowns, handkerchiefs and nightwear. English and Polish. Poland. Axminster and tufted carpets and rugs in 80:20 wool:nylon. Site in English, Polish and German. design and produce plastic animals, big and small dwarfes, decorative and egyptian figures. poland. Translation and Interpreting office working with the Polish, German and English languages. Located in the west of Poland. Translation, teaching, and lexicography in English and Polish provided by a freelancer based in Poznan, Poland. offers a large catalog of mouth-blown, hand decorated glass ornaments from poland. christmas ornaments factory that uses the traditional methods of manufacturing hand painted and blown glass balls. poland. manufacturer of filtered water jugs, plastic containers, spray hoses, and bottle cap sets. poland. News and articles covering the retail and FMCG market in the Czech Republic, Hungary, Poland, Russia and Slovakia. Site in polish and English. Furniture, interior design profile and contact information are shown. Located in Poland. Poland. Manufactures machines for producing interlocking bricks and pavement borders. Site includes examples of end products. Planks, sawn timber, construction wood , elements for doors and windows, floors and stairs. Located in Koszalin, POLAND. Court-sworn translation and interpreting in Polish, English, German, Italian, French, Spanish and Russian. Based in Lodz, Poland. Polish and English technical translations related to mechanics, construction, building, electrics, and electronics fields. Company based in Wroclaw, Poland. Grower of pine and spruce Christmas trees, with operations in Poland, Germany, and France. Description of the offered species, cuttings and packing machines. Agency based in Bydgoszcz, Poland, provides Polish-English and Polish-Danish translation and interpretation. Formal wedding photographer originally from Poland with over ten years of experience. Pharmaceutical and chemical importer in Poland. Poland based designer offers full collections archive galleries, press and contact information, illustrations portfolio, and textile details. manufacturer of tea and coffee sets, kettles, dishware, and hand made pottery. poland. Specializing in fashion and beauty photography for editorial uses. Based in Poland, working worldwide. Poland. Woven fabrics for the garment industry, from wool and wool rich blends. Dyeing and finishing capabilities. manufacturer and exporter of living room, dining room, bedroom, and outdoor furniture. poland. manufactures headphone amplifiers, which are designed around one transistor. also sells accessories for headphone users. poland. Planning and construction of individual machines or complete systems for the production of fruit juice and concentrates. Provides consulting, design, manufacture, placing into operation and training. Poland. Poland. Manufacturers of cylinders, sinkers and accessories for circular knitting machines. Also, custom CNC metal working services. English, Polish and German. Importer of beers, wines, and spirits, and distributor of domestic vodka in Poland. Company and investor information, news, brands and contacts. Formal wedding photographer originally from Poland with over ten years of experience. Serving the Chicago area. Poland. Import and wholesale of nonwoven interlining fabrics for apparel and embroidery applications, from viscose, polyester and blends. Also, distributors of sewing machines and accessories. English and Polish. Agency based in Bielsko-Biala, Poland, provides translation, interpreting, and software localization in many language combinations. Specializes in the areas of technology, science, business, law, marketing, and sociology. Manufactures a variety of wood and metal stair kits and components. Product specifications and photographs online. Headquarters in several countries with manufacturing in Italy, Poland, and Canada. gdansk, poland. construction of vessels up to 100m as well as design, cutting, and fabrication of steel plates, superstructures, and hulls. they brief describe their history and facilities, with a list of completed projects. Retail, wholesale, and export grower of clematis in Poland. Includes encyclopedic reference with information and photos of several hundred species. poland. sourcing of local textile companies and sewing operations for contract manufacturing of garments and home textiles. english and polish. Manufactures plastic cord, custom clotheslines and TIR cables with steel, plastic or sisal cores. Factories in Holland, Poland and Slovakia. poland based silicon wafer manufacturer of diameters 100 to 150mm. capabilities, dopant types and specifications, online inquiry form. Poland. World wide traders in textile goods, chemicals and accessories, yarns, and cotton fiber and wastes. Also, organizers of specialty industry fairs and events. English and Polish. Poland. Manufacturers of spun and continuous filament threads for sewing and embroidery applications, for polyester and polyamide. Technical information, color cards and specifications. English, Polish and Russian. usa based nvocc with offices in poland, the uk, hungary, lithuania, germany, canada and france offering full container load export and import services from north america to europe. Poland. Manufacturers of spun and filament threads for sewing, embroidery and needlework applications, from cotton, polyester and blends. Also, embroidery kits, and quilted fabrics. electronic assembly services provider for small prototypes and production circuit board runs, plus metal and plastic housings and cable mountings. in english, german, and polish. straszyn, poland. Poland. Manufacturers of pressed felts and needlepunch fabrics for geotechnical, automotive, filtration, upholstery and industrial applications, from polyester and polypropylene. Also, polishing discs. Technical specifications. English and Polish. Poland. Manufacturers of polyester filled quilts, pillows and mattress covers, with woollen ticking fabrics. Detailed product catalogs, including technical information. Multi-lingual site. Poland. Dealers in pre-owned sewing machines, complete sewing stations and garment steaming systems. Also, spare parts, accessories and attachments. English and Polish. Poland. Dealer of industrial sewing machines, pressing equipment, fusing, forming, and cutting machines, parts and accessories for the textile, upholstery and leather industry. Poland. Design and manufacture of turnkey plants for absorbent airlaid nonwoven fabrics for hygiene disposables, medical, filtration, packaging and cleaning applications. Producer and processor of chicken in Poland, counted among European leaders. Offers a comprehensive chicken product assortment from fresh meat to the most processed fine products. Poland. Machinery and parts for the textile, paper and nonwovens converting industries. Slitters, winders and rewinders. Also, shafts and safety chucks. English, Polish and German. Manufacturer and supplier of HDPE pipe headquartered in Finland, with manufacturing plants in North America, Finland, Sweden, Denmark, Poland, Czech Republic, Thailand and Malaysia. Poland. Manufacturers of high-loft waddings and needlepunch fabrics for bedding, apparel, upholstery, packaging and industrial applications, from polyester and polypropylen. Part of the Peruzzo Industries Group. English, Polish and German. Poland. Specializes in trade of equipment for paper and plastic flexible packaging industry. Includes bagmaking machines, laminators, coaters, flexographic and rotagravure printing presses, extruding lines, and web processing units. Poland. Manufacturers of raw white and custom solution dyed polypropylene multi-filament yarns for weaving, braiding and sewing applications. Also, packaging and storage bags, and agricultural strings. English and polish. Poland. Fiber preparation, carding and crosslapping machinery for the nonwovens and textile industries. Also, textile waste recycling systems and tools for machine repair and overhaul. English, Polish and Chinese. Poland. Manufacturers of greige, bleached, dyed and printed fabrics for apparel, furnishing and industrial applications, from cotton, linen and blends. History of local linen industry. English and Polish. Specializes in development land, investment property, resorts. Locations in Europe, UK, France, Germany, and Poland. Specializes in translations from Polish to English and from English to Polish, more than 20 years experience. Poland. Manufactures drop, closed die, and finished forgings. Includes tractor parts, flanges, and continuous longitudinally welded tubing. Also produces parts in titanium and aluminum alloys and has machinery for sale. Poland. Design and manufacture of bedcovers, pillows, table clothes, table sets, runners and doilies. Product gallery, including technical information. English, Spanish, French, Russian and Polish. Trade portal delivering business news, reports, outlooks and surveys. Country pages on Finland, Russia, Estonia, Latvia, Lithuani and Poland. Bi-lingual, mostly in English, partially in Finnish. Poland. Chemical and thermally bonded fabrics for interlining, geotechnical, upholstery, filtration and filling applications. Spunlace and needlepunch fabrics for medical and hygiene disposables, automotive products and footwear. Also, PVC floor coverings. Architects, urban designers, masterplanners, town planners, landscape architects, regeneration and sustainability consultants, and interior designers. Offices in the U.K., Portugal, Spain and Poland. Poland. Vertically integrated group of textile manufacturing companies. Collections of printed and dyed bed and bathroom linens and towels. Also, weaving and knitting yarns, greige and finished fabrics, blankets and ready-made garments. English and Polish. Poland. Diversified manufacturing company, active in machinery, environmental engineering and metal working. Blowroom equipment, fiber opening and preparation, feeding and carding systems for yarn spinning and nonwovens production. English, Polish and German. Poland. Vertically integrated textile manufacturing company. Woven, yarn and solid dyed, and finished fabrics for bedding and mattress ticking applications, from cotton. Part of Andropol SA. English, Polish and German. Translation agency from Opole, Poland, provides translation and interpretation services in many languages, including English, German, Spanish, French, Estonian, Russian, Ukrainian, Chinese, and Hungarian. Poland. Shapers, one two and three-side multi spindle drilling machines, drilling-shaping machines, circular saws with under-cutting attachment, tenoning machines. Poland. Manufacturers of jacquard and flat-bed knitted, dyed, printed and finished fabrics for apparel applications, from cotton and man-made fiber blends. Fabric catalogs, including technical specifications. Links to garment companies. English, Polish and Russian. Produces insulation panels using a wide range of laminates and insulation cores. Website offers various language options. Offices in Poland and Belgium. Manufacturer of precision optics including flats, prisms, mirrors, splitters, polarizers, and objectives. Also manufactures EO optics including Pockels cells. Poland. 149 minerwa company podhale, poland. Poland. Manufacturers representatives and distributors of textile and fiber spinning machinery and parts, natural and man-made fibers and yarns, and dyestuffs and auxiliaries for the textile and leather tanning industries. Links to principal companies. English and Polish. Poland. Design and manufacture of woven, wall to wall axminster carpets for residential applications, from wool and polyamide. Also, area rugs, runners and mats. Detailed carpet catalogs, including technical specifications. English and Polish. Poland. Needlepunch fabrics for the construction, geotechnical, carpet, footwear, automotive and upholstery industries, from viscose. polyester, polypropylene and polyamide. Spunlace fabrics for technical applications. Also, tufted carpets. Detailed product specifications. English and Polish. BEFARED: Manufacturer of gears and gear-motors from Poland. Manufacturing gears and gear parts according to customers specification. Poland. Vertically integrated textile manufacturing company. Open-end spun rigid and stretch yarns for knitting and weaving applications, from cotton, hemp, linen, viscose, spandex and blends. Also, bleached, dyed and printed bedding and apparel fabrics. Technical information. English and Polish. Poland. Multi-national group of textile and nonwovens manufacturing companies. Needlepunch, thermobond and spunbond fabrics for bedding, upholstery and agricultural applications, from polyester and polypropylene. Also, narrow fabrics and materials for furniture upholstery. English, Polish and Russian. Poland. Government institute for research and development in process technologies, applications, quality standards and marketing of materials and products for the textile industry. Also, testing and technical consultancy services. Calendar of conferences. Links to related sites. English and Polish. Poland. Vertically integrated textile manufacturing company. Terry and flat woven, color woven, dyed and finished towels and bathrobes for hospitality and corporate promotion applications, from cotton. Logo embroidering services. Also, table and dish cloths, and bed linens. Presentation videos. English, Polish and Russian. poland. manufacturers representatives and technical consultants for machinery, equipment and parts, active in transport, industry, mining, laser technology and recycling. complete plants for sorting, shredding, processing and baling of plastic and ferrous materials. also, oil filtration systems and vehicle drainage technologies. english and polish. Poland. Group of manufacturing companies, active in PVC films, granulated products, panels, artificial leathers, coated fabrics, flexible food packaging and wallcoverings. Knitted fabric backed artificial leather for automotive, apparel and footwear, upholstery, printing and bookbinding applications. English and Polish. Poland. Vertically integrated textile manufacturing company. Woven, yarn and piece dyed, and finished fabrics for apparel, decoration and furnishing applications, from linen. Detailed fabric catalogs, including technical information and color cards. Information about the history and cultivation of linen and flax. English and Polish. Poland. vertically integrated textile manufacturing company. Solution dyed, medium and high tenacity polypropylene filament yarns. Flat and tubular woven technical fabrics for industrial bags, geotextiles and shading applications. Also, jute, hemp and linen yarns and fabrics. Technical specifications. English and Polish. Poland. Commercial research and development company, active in textile and nonwovens machinery. Fiber preparation systems, carding machinery, crosslappers, yarn spinning and fabric inspection machinery. Also, recycling systems and laboratory equipment for nonwovens product development. English and Polish. Sells mint issues of Poland and other former and current communist countries. Offers glass-blown and hand-painted ornaments from Poland. Unikat and traditional patterns from Zaklady. Based in Poland. Handmade lace lingerie from Poland such as G-strings, shorts, blouses and sets of underwear. Offers mouth-blown, hand-painted glass Christmas ornaments from Poland. Unikat and traditional tableware and cookware from Ceramika Artystyczna in Boleslawiec, Poland. Mouth blown and hand painted glass Christmas ornaments from Poland and Germany. Offering painting, photography, sculpture, and graphic arts by Polish artists. Located in Poland. Features Royal Krystyna mouth-blown, hand-painted glass ornaments from Poland. Stoneware from a traditional, generations-old factory near Boleslawiec, Poland. Offers a variety of pieces and patterns. Offers food products from Serbia, Bosnia Herzegovina, Croatia, Hungary, Bulgaria, Slovenia, Poland and other countries. Features handmade stoneware from Boleslawiec region of Poland including dinnerware, bakeware, coffee and tea sets. Features original vintage and contemporary posters for movies, theater, and art events. Located in Poland. Prices in US dollars. From Poland, handmade products including pierogis, uzska (ravioli), meat or cabbage croquettes, and barszcz (beetroot soup). Retailing ceramics and pottery from Poland, Italy and Europe as well as Smoking men and nutcrackers from Germany. Web shop with movie posters from Poland. Canada-based site offering coffee and teas from Australia, Canada, Poland, Hawaii and England. Featuring blown art glass from Poland. Featuring Unikat and Traditional Polish Pottery stoneware from Boleslawiec, Poland for sale at retail and wholesale prices. Also, gourmet gift baskets and all occasion shopping. Importing directly from Zaklady Ceramiczne Boleslawiec in Poland. Selection includes first quality pieces in a variety of patterns and styles. Located in Maryland. Old time handmade pottery from Boleslawiec, Poland. Sells a variety of dinnerware and kitchenware in traditional patterns. New and used CDs, vinyl, and music DVD from Poland. Offers stoneware tableware pottery from Boleslawiec, Poland. Includes kitchen and cookware, tableware, and gifts. Features Ceramika Artystyczna and Zaklady Polish pottery from Boleslawiec, Poland. Traditional and unikat patterns available. Polish glassware, wooden eggs, and table linens are also available. Tour company with trips in Poland and Romania. Includes brief descriptions of birding areas in Poland. Spotlight on Poland from CnnSI with latest team headlines, profiles and history. Entrance to the camp in Poland during Cruise of the Calgaric, 1933. Organised motorcycle tours in Poland. Two bikers organise tours around Poland to suit individuals or groups. The official Polish Lowland Sheepdog Club of Poland. Links to other Polish clubs, breeders, pictures, shows, and FCI Breed Standard. 207 Poland Spring Campground Poland Spring. Poland. Photos and show results. Urban exploration photos from abandoned places in Poland. Breeder located in Szczecin, Poland. Information on breed and photo gallery. Kennel history, show results, photographs. and pedigrees. Poland. [English and Polish]. Breed description, photographs, individual dog profiles, and litter information. Wadowice, Poland. Kennel history, show news, pedigrees, and breeding plans. Poland. Includes photos, dog profiles and competition results, and puppies. Located in Ujscie, Poland. Breed description, kennel history, photographs, pedigrees, show results, and breeding plans. Poland. Siberian Husky kennel. Includes photographs, puppies, pedigrees and show results. Gliwice, Poland. Small family cattery located in Wroclaw, Poland. Information in English, Polish, and German. Co-educational, residential facility in Poland, Maine. Provides details of services, staff, programs, and student life. A full service campground located in Poland in the Adirondack foothill region. Provides directions, facilities, rates and site map. 11-meter group based in Poland. QSL and membership information. Locate a dentist in France, Germany, Hungary, Poland, Spain, Sweden or Tenerife. Includes articles about treatments, FAQs, a forum and a newsletter subscription. Features the J-1B Don Quixote, J-2 Polonez, J-3 Eagle, J-5 Marco, and J-6 Fregata designs by Jaroslaw Janowski of Poland. Specializes in the mounting of game birds. Includes the artists profile, photos, a price list and field care information. Located in Poland. Girls summer camp located in Poland. Read about the activities, campers, and the staff. Also, look at last years camp pictures. Join the list to discuss classic automobiles (samochody) from Poland such as the Fiat 126, Polonez, and the Syrena. Provides competition information, qualifying timetable, event schedule, host city information and news. Traditional residential summer camp for girls ages 8-15 located in Poland. Includes map, photographs, program information and other links. Prue Osborn describes how the Philadelphia Dragon Boat Team is practicing for the World Championships in Poznan, Poland. Includes interviews with team members. Images of notes printed as early as 1898, from china, cuba, estonia, germany, italy, konigsberg, poland, and russia. All images are 400 dpi, with a gallery of 1000 dpi images. Owczarek Podhalanski is also known as the Tatra Sheepdog. Photos, facts, Poland, guardian. E-mail for more club information. Detailed information about Polish show caves. Alphabetical index, clickable map, geology and literature index. Located in Poznan, Poland. Offers four and six year European M.D. programs, a graduate program in Physical Therapy, and a five year dentistry program, taught in English. Gives details of the courses, admissions, and facilities. European Champions and 1000m World Record holders. Charts their progress in the 2003 World Nations Championships in Poznan, Poland. Includes history of the sport worldwide and in Britain, team news, results, photos, prior year achievements, message board, and related links. Freelance technical editor from Poland. The site includes personal info, sample work, links. Some content in polish. Small studio founded in 1997 from Poland designing alternative fonts. Szczecin Technical University (Poland). Machine learning and knowledge (data) mining, optimal (kalman) filtering, expert and decision support systems. Offering design, e-commerce, hosting and promotion solutions. Design in up to 5 languages, English, German, French, Polish and Russian. Based in Sosnowiec, Poland. Research and development in biometric and acoustics. Fingerprint recognition with ultrasonic holographic camera. Ultrasonic technology: transducer, electronics, ut-pc cards, pulser and receivers (for emats too), amplifier, scanner for laboratory use, plastic pipe measurement. Fingerprint recognition with ultrasonic holography, recognizes living fingers. Software for fingerprint recognition. Synthesis of fingerprints (compression - 8 bytes needed). Ultrasonic technology, R&D in biometric and acoustics. general practice law firm based in clarksville. Discussion board about Poland and everything Polish. To the bishops of Poland. On the Mariavites or Mystic Priests of Poland. The society had been suppressed in 1904, but some of the members were still carrying on as though nothing had happened. Pius again reprimands them in this encyclical, promulgated 5 April, 1906. Tracing Jewish Roots in Poland, Ukraine, Moldova and Belarus. Site of a U.S. firm with offices in Ukraine and Poland specializing in Jewish research in the archives of Eastern Europe and Customized Tours. Besides self-promotion, the site features a number of maps and pictures of various towns and places, synagogues, monuments, etc. 291 Khamoro, Real Romani From Poland. 292 Casimir of Poland Illustrated profile. Profile of the Apostle of Poland. Illustrated. Poems, artwork, and photographs of Poland. Financial benefits and Polish heritage. Ancestral history including the associated Matloka and Grzymala families, from Poland to the USA. Looks at the Franciscan priests activities in wartime Poland. Grandbury, Texas woman has prayer, salvation, and childrens pages, and family photos. Travels from Middlesbrough, England to Poland, Zaire, Pakistan and Saudi Arabia. Plus pictures of his house and garden. Polish American monthly newsmagazine in English features local and Poland news as well as serials. Yahoo! group for Poland-related issues and events in Washington, D.C., northern Virginia and suburban Maryland. Travel pictures, including Poland, Amsterdam and NYC, birthday and occasion pictures, and favourite links. A collection of photographs of the Baral, Feuer and Ehrlich Families all from Cracow, Poland. On the Afflictions of the Church. Decries attacks on the Church in Russia, Poland, and Italy. Encyclical promulgated 21 October, 1867. Researching the lineages of Bromberek, Bumber, Kozlowski, and Wesolowski who emigrated from Poland and settled in Lemont, Cook, IL USA, and Irish origins of Howe, Madden, Riordan and Tracey. huge collection of black and white photographs from cemeteries in russia, poland, belarus, the czech republic, italy, france, germany, finland and the usa. in english and russian. Ancestors and descendants of Abraham Blumberg and Rebecca Kaplan. Includes Bielsk Podlaski and Ellis Island connections, compiled by Andrew Blumberg. Researching the Werk and Bednarz families in either Germany, Poland or the United States. Compiled by Siegrid Robinson. Family history of Daniel Tarara (b.1852) from Slask near Oppeln, Germany (now Opole, Poland after WWII). Arrived in St Paul, Minnesota via New York, 1883. Includes link to surname forum. Old Strathcona, Edmonton. Served by the Oblate Fathers. Contact information, schedule, history, information on parish ministries. A memorial to four hundred years of Jewish civilizaion in Zabludow. Many photos and English translations of very rare historical documents. This site features the books of James C. Martin: Push Not the River, and Against a Crimson Sky, his newest novel. Both books are historical fiction set in Poland. Zaluski Family of Poland, Canada, UK, and USA. About the Shrine of Jasna Gora and the Pauline Fathers who run it. TEFL job postings listed on a Yahoo! discussion board. A list to support all English teachers (and ESL/TESL/EFL/TEFL) in Poland. Not affiliated with any business or organization. To support all English teachers (and ESL/TESL/EFL/TEFL) in Poland. (1984- ), katowice, poland. biography, picture, and links. (1922- ), poland. sound files, biography and picture. Official web site. Black metal band from Poland. (1975- ), poland. news, sound files, works, and biography. born in poland and now living in denmark. paintings, drawings and computer graphics. official site of the musician based in poland. includes sound samples. Marian Buckley interviews the designer and lays out the journey from Poland to London. (1958- ), gdansk, poland. biography from the edmonton composers concert society. (1934- ), pabianice, poland. biography, compositions, discography, photographs, and review. Waldemar Nowak from Poland is a top mime artist. He took a part in many festivals on the world. (1985- ) cracow, poland. biography, list of works, schedule and gallery. (1962- ), poznan, poland, lives in switzerland. biography, works, news and literature. Holocaust-related images taken in winter around Poland and Hungary. Exhibited at the University of Texas, Dallas. Poland. Designer and stylist of clothing, hair and make-up. Includes resume and examples of his work. Official site for the former Megadeth guitarist features projects, news, sound clips and gig dates. Jazz band from Poland. History, biography, discography, MP3s, press, pictures, events and other projects. Poland, Ohio-based production company. Background information, film downloads, an interactive story, and links. Hand-crafted instruments from Poland, very often with unique constructions and built on order. Offering sound samples. painter and weaver. born in poland, living and working in rijswijk. includes brief biography and gallery of paintings and tapestries. Video review by David Poland. Requires Flash. cityscapes, portraits, and nudes. selection of paintings, biography, and studio views. an overview of folk music in poland, with profiles of a number of bands from the magazine 'czas kultury'. original oil paintings and prints by a maryland artist featuring pastoral settings and scenes from poland. offers commissions and prints. Classes for ages 1-14 structured in a seven-year learning system in Austria, Germany, Italy, Poland, South Korea, Spain and Turkey. Brief details of this group from Stalowa Wola, Poland, including history and image gallery. [English/Polish]. featuring the work of artists, musicians and poets from poland, estonia, and the uk. reviews and information about the selected artists. music and film can be downloaded or streamed. in english and polish versions. Produces artistic arrangements of original folk dances, music and costumes from various regions of Poland. Includes their repertoire, awards, concerts, upcoming schedule and photo gallery. ukrainian quintet with piano, sax, trumpet, bass and drums playing jazz original compositions mixing fusion, free jazz and ethnic elements. lists festival performances in ukraine, russia, poland, germany, and france. [Lodz, Poland] The International Festival of Photography in Lodz takes place in May, and features exhibitions, lectures, workshops, meetings with authors, movie projections, and slide-shows. Flash Site. SiteBook Poland City Portrait of Poland in Indiana. 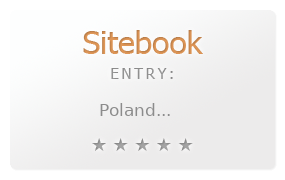 This Topic site Poland got a rating of 3 SiteBook.org Points according to the views of this profile site.